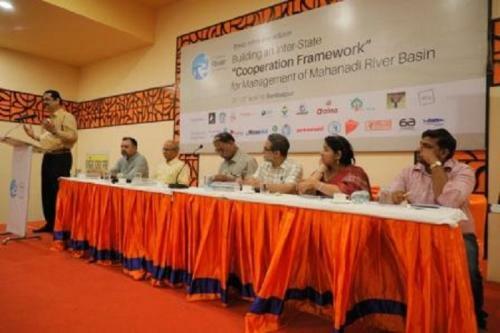 The 2nd Odisha River Conference, which is organised by the Water Initiatives Odisha (WIO) and Mahanadi River Waterkeeper, commenced today in Sambalpur. The theme of this two-day conference is 'Building an Inter-State Cooperation Framework for Management of Mahanadi River Basin. “No doubt Chhattisgarh has constructed many dams and barrages without the consent of Odisha and has obstructed lot of water, but that does not mean we can conclude that Chhattisgarh has siphoned off water from Odisha’s share. We need a comprehensive understanding and analysis of the impacts all these structures will have on availability of water in the basin. Let the tribunal decide how to make such an analysis and instruct Chhattisgarh to stop these obstructions if they are found to be illegal. But, let’s not close the door of dialogue and cooperation between the two states on several issues that need urgent attention. Barrages alone are not killing Mahanadi, there are many other factors that need urgent intervention,” Panda said. Vice-Chancellor of Sambalpur University Prof Deepak Behera, who was the chief guest on the occasion, announced that a research project dedicated to Mahanadi will be initiated in the university. The project will not only be limited to the university lab, it will involve field-level work as well. He added that a proper assessment of water availability and distribution between different priorities is important to understand the challenges as well as suggest measures to solve them. He emphasised resource mapping involving communities of the basin to ensure their stake on the river. Prof Premanand Panda, who chaired the inaugural session, said while seeking a solution to the Mahanadi problem, we should not have an Orissa-centric approach but a river-centric approach. He added that rights of a river can be established when people are empowered to use water judiciously. He maintained that water rights is a part of human rights because when a river dies a civilisation dies with it. He explained the statement while drawing examples from across the world. Among others, climate change expert Saroj Dash, civil society leaders Umashankar Sahu, Sneha Mishra and Prafulla Hota and senior journalists Ashok Pradhan, Mehboob Mehtab and Bijay Mishra, gave emphasis on dialogues and cooperation framework for river conservation to ensure rights of the communities and the river. All the best Ranjan and the team! Glad to hear fruitful dialogue and actionable outcome from the convener of WIO ..wish all the best ! The indiscriminate use of natural resources without consideration of associated factors for immediate economic gain resulting such problem. So to sort out the issue in such cases there is need strong political will to recover and consideration of socioeconomic issue of dependent population.No wonder such type of problem will rise in future, due to increase in population and vision for immediate gain and no consideration of management of ecosystem.So there is need to revisit these cases to take timely action wherever needed.